The trend these days is to build big, as evidenced by the larger models now offered by many trawler and cruising powerboat builders. Custom or production boat, no matter-it seems the focus is to satisfy bigger budgets and over-the-top accommodations. But thankfully, this is not a universal trend, and there are still some builders who see the need for offering smaller boats for those of us who don&apos;t want, or can&apos;t swing, an expedition yacht of major proportions. One such company is Yacht Registry of Dunedin, Florida, which represents trawler-style yachts from Fuzhou, China. Mark Reder and Ron Tucker have reintroduced a boat from a hull built back in the mid-&apos;80s in Taiwan. Chinese boatbuilding is a growing industry, and the quality of Chinese construction has improved enormously in recent years. As a result, Yacht Registry can sell a modern, competent boat that is well within the means of most trawler-hunting couples. I spent some time aboard the company&apos;s Heritage East 36, and I doubt anyone can squeeze more room out of a 36-foot hull. It was Hull Number 31, and its owner, Tim Hart, told me that some 250 of the boats were built previously. With a base price just over $200,000, the 36 is a classic sundeck motoryacht-style trawler. Tim and Carole Hart have had great times aboard Carole H, traveling from Florida to Canada, across Lake Champlain, around the Rideau Canal and down the St. Lawrence. With a draft of 3 feet 8 inches, they have also been able to travel the shallow waters of the inside passage in New Jersey from Cape May to Manasquan, no mean feat for those familiar with that tricky waterway. The boat comes standard with a single diesel engine and does 9 knots at 2000 rpm, burning just 3.5 gallons per hour. Not bad economy, considering today&apos;s fuel prices. The Sundeck profile may not appeal to traditionalists, but for those interested in maximum use of space, it is a layout that&apos;s hard to beat. And my usual complaints of the sundeck approach have been creatively resolved by the builder. Getting aboard such a boat usually involves climbing a vertical ladder from the swim platform to the aft deck, and side access is usually too tall to make an easy step up from a dock. While the side deck of the Heritage East is indeed 54 inches off the water, too tall for my legs, the 30-inch wide swim platform leads to a molded stairway up to the aft deck, which is terrific and much appreciated. In fact, owner Tim Hart explained that they cruise with two Norwich terriers, Skippy and Jack, one of whom is 16 years old. The dogs have no trouble getting on and off the boat, a statement that says it all. The swim platform includes a built-in swim ladder, and there is a 24-inch-square hatch on the stern that opens into the master aft cabin. The side decks are 16 inches wide, and with 30-inch-high stainless-steel railings, moving around the boat is secure and without drama. I noticed a minimum of exterior teak on the boat, something much appreciated by contemporary boat owners who prefer to go boating rather than refinish brightwork. I also noted shorepower connections amidships on the starboard side, so reaching shorepower is not an issue, whether the boat is docked bow or stern in. The bow is 5 feet off the water, and the uncluttered foredeck includes a vertical Simpson Lawrence windlass and dual anchor rollers. The aft sundeck is two steps up from the side decks and measures 8 feet long by 11 feet 6 inches wide. A fiberglass hardtop provides weather protection for those sitting on the sundeck, as well as a handy place to store a RIB. The sundeck has a built-in bar with sink and counter to support entertaining outdoors. Four steps up from the sundeck lead to the flybridge, obviously the command center of this design. Owing to the height of the sundeck&apos;s hardtop, the visibility from the flybridge is outstanding in all directions, even when there&apos;s a RIB in its cradle. A center helm chair is flanked by two bench seats with storage underneath. The exterior of the Heritage East 36 is very civilized for those who spend much time outside while under way or at anchor, and it will definitely appeal to those who live aboard. Lots of built-in storage adds functionality for extended waterway cruising. After all, everyone needs a place for all that cruising gear! The layout of the boat employs a classic separation of guest cabin and head forward, with master stateroom and en-suite head aft. The benefits of the layout are proven by the success of other trawlers, notably the Grand Banks 42 Classic (now known as the Heritage series, coincidentally). The standard saloon arrangement has no built-in seating, enabling owners to use comfortable chairs instead of enduring squared-off settees, another nod to function over tradition. A door 20 inches wide by 64 inches high leads from the sundeck into the saloon, and it is three steps down to the level of the saloon sole, well inside the hull. The lower helm has a starboard side door, but it is like the top half of a Dutch door, as the boat&apos;s side decks are just under the saloon windows. The saloon measures almost 10 feet long by 9 feet wide, and headroom exceeds 6 feet 5 inches throughout the boat. Joinerwork is typical for Far Eastern boats-good, if not inspiring-and the large, opening side windows add lots of ventilation and light to brighten the interior. Three steps down forward of the saloon (the stair structure is hinged to allow engine room access) leads to the portside galley, with head opposite. The galley is a U-shaped affair, with deep double sinks, a propane stove and an oven (the propane tank is located on the flybridge under the console), and sufficient counter space for cooking chores. The location of the galley makes it a down galley, in one sense, but the forward saloon windows are located so as to really open up the galley area, and anyone working in the galley can easily maintain eye contact with those in the saloon. It is perhaps the best of both worlds in the galley up/down debate. The forward cabin is cozy with a bench seat and Pullman-style double berth, with storage under. The 8-foot-long stateroom has a 24-inch opening hatch above and 12-inch opening ports on each side of the hull, so the space remains bright and well ventilated. Walking back aft through the saloon to the aft master stateroom, I envisioned how well this layout would work for a family, or for a couple with occasional guests. The master cabin takes full use of the 8-foot-long by 11 feet wide aft section of the hull and maximizes liveaboard accommodations. There is an island queen berth, built-in bureaus and hanging lockers, and enough useable storage for anyone. Mirrors above the side bureaus enhance the visual space of the cabin. Nice. The master head has a separate stand-up shower and the usual bathroom amenities, with full standing headroom. A large locker on the starboard side of the stateroom houses a combination washer/dryer. Sitting on the master berth, with the cabin&apos;s sliding pocket door open, I found it hard to believe this trawler&apos;s interior was inside a hull that measures just 36 feet! And best of all, it is accomplished without feeling squeezed or claustrophobic; rather, it feels open and relaxed. I did note that some of the opening steps and lockers are open to the engine room space, which means the boat is louder than necessary when the engine is running. A little sound deadening would go a long way here. Access to the engine room is through the galley steps, or by lifting hatches in the saloon sole for excellent engine room access. The boat is built with a single Cummins 210hp diesel, and two fuel tanks straddle the engine, leaving lots of room around the engine for maintenance and inspection. I measured 24 inches around the engine, with the genset located forward. Some of the details of the standard engine room suggest owner improvement. I would definitely order, for example, the optional dual-switchable Racor fuel filters and replace the original Chinese all-purpose batteries with modern AGM deep-cycle units. A three-phase battery charger would also be on my wish list, as would a sound shield for the genset, but all of this is easily accomplished by the dealer. 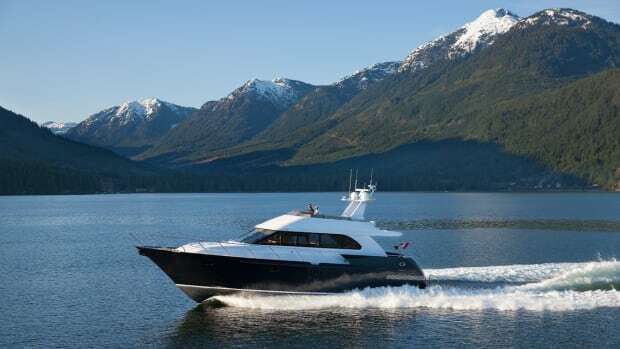 But these are not really issues with the overall boat, and the semi-displacement Heritage East 36 has proven itself with single-digit fuel economy at single-digit speeds, and it maximizes accommodations in a boat that is easily handled by a couple. It has everything that most couples need to do the Great Circle Route, enjoy coastal cruising or spend their winters in the tropics. And it would make a fine liveaboard. There is also a new 42-foot version with a larger galley and a dinette opposite. Both models show that it is possible to build an honest boat that gets you and yours out on the water without breaking the bank. And best of all, you can learn to live without those darned ladders!